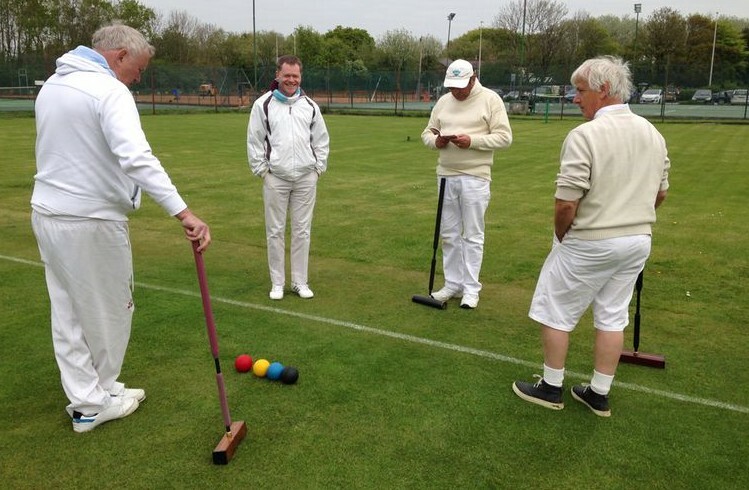 Win or loose this is the sort of day Croquet dreams are made of. Sunshine, laughter and a light lunch. Well actually pork chops and chips. Bury set out two lawns at Coronation Park with a four yard overlap down the East boundary of both. Tertiary colours were employed for single banking. In the final game it was noted that these had expended in the Sunshine and were jammin I say jammin in the immaculately set hoops. Although these lawns have the same dimensions as our own lawn 5, the effect was disorientating for us and some mistakes were directly attributable to this. The old white lines were very much still there and had to be ignored in favour of a string boundary. But it was an interesting experiment. Our final games this season. Win or loose this is the sort of day Croquet dreams are made of. Sunshine, laughter and a light lunch. Fylde took advantage of some unforced errors here and there but were playing on top form. Lee winning with a triple was good to see. Peter gave away two contact leaves and finished the last one with a three ball break from hoop one. Liz's tactics were up to the usual mark as was her break play. 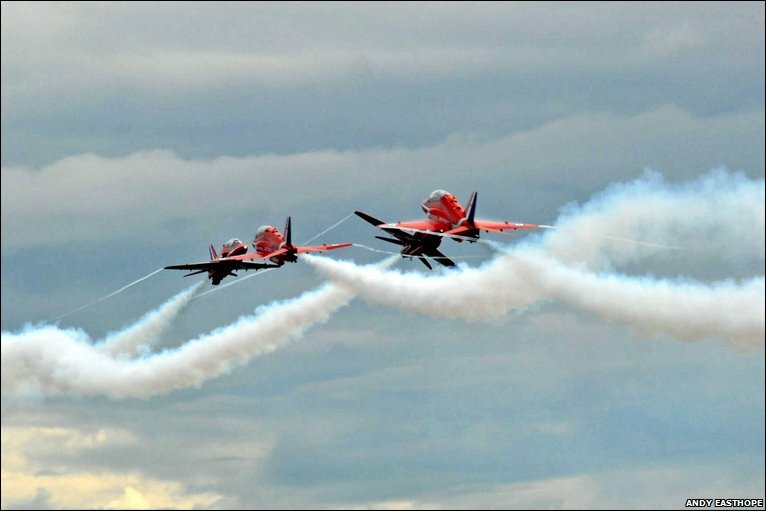 A muggy day with low cloud cover for both Croquet and the Red Arrows who did several low level slow steep banks over the lawns perhaps to approach Blackpool Airport or maybe to see Howard in play. On lawn three Peter streaked away to a two hoop lead against Howard, but he kept his cool and with a couple of precision breaks pegged that lead back and converted it to a win. We also lost the doubles as Garry enjoyed a very fine early break and Andrew finally clicked. Our hot slow cooker lunch and crusty bread obviously upset the visitors. Things were different in the afternoon. Constant cycle of blazing sunshine (5 minutes), High winds and cloud (5 minutes), Rain (5 Minutes). A closer match than the score suggests. As always in this game a snick here or a fractional miss there decides the game. Fylde played well with several all round breaks but the points went to the home side. Our opponents were generous to a fault allowing us an early start and a fast lunch in order that we might return to the last night of Lytham Proms in good time. It is not unusual to see Bowdon looking so good. We played on the green green grass of the high lawns. Peter, being at his best hit a couple of thunderball roquets in the doubles, Liz brought a woman's touch to the game with a good break to peg. Didn't it rain? you may well ask. Well no, although the forecast was hit or miss, it was dry. Terry suffered a bit, leaving his approaches short. "Run on" ! he exclaimed. The home side asked us, "What if he should ever leave you"? "Ask him to stay until tomorrow" We replied. Our first match in the new B level league played in warm Sunshine. The lawns looking beautifull had some early dew with the hoops set quite tight. In the morning Peter (2)/Betty (10) lost to Ray Lowe (1.5)/Tony Thomas (5) -14 while Terry (7) beat Keith Roberts (5) +7. After a good lunch Peter beat Ray +15, And Betty lost to Keith -25 leaving Terry and Tony to entertain the crowd who were finishing off the cakes. This game went to Tony +7 taking the match too. There were no bonus points. Warm friendly conditions. Again Peter was right off it but Liz played well and deserved more with Lee warming up and playing like a Macheeeen. Perhaps the luck went against us rather often. No bonus points. Warm friendly conditions. Peter was right off it. Lee needed to warm up and play like a Macheeeen. Perhaps the luck went against us rather often. 3 bonus points given away. The ref answers the minus players' query: Where does it say I can not play blue, take croquet from yellow and not have black as a ball in hand? That will be 19(b)(1) then. Anyway, a bonus point for Crake in warm still conditions. Only our #3 performing well.